I have a full time job outside the home, a busy husband and three very social teens so my schedule gets a little hectic sometimes. Sometimes it’s easier to just pick up some fast food and call it a meal. But we are not really all the crazy about eating fast-food all the time and eating out to a decent restaurant is not practical at all on our budget. So what’s a busy mom to do? Well, I rely on quick and easy meals that I can whip up on a weekday and I try to plan meals ahead. For instance, Sunday at our house is usually roast day. I would roast a couple of chickens or big chunks of beef or pork, and use the leftovers to create quick and easy meals during the week. We can usually last until Wednesday before someone starts whining, ‘chicken again?’ or something to that effect. To avoid the ‘same meat’ overload that my plan can sink you into, consider planning meals ahead of time and alternate your meats. That’s what I did this past weekend, following some of the tips on Jane Doiron’s Make Ahead Meals for Busy Moms. This past weekend, I made lasagna (I’ll post the recipe separately). I made enough to make two big pans. We ate one, and I froze the other for another meal later in the week. We also made egg rolls that we’ve put in ziplok bags in the freezer; ready to be fried for a quick meal during the week. While making the eggrolls, I also chopped up extra vegetables for pancit or Filipino Noodles (they use the same kind of veggies). We placed all the chopped veggies in ziploc bags and threw them in the freezer. Later in the week when we’re ready for some noodles, we’ll just stirfry them up and be eating in less than an hour. 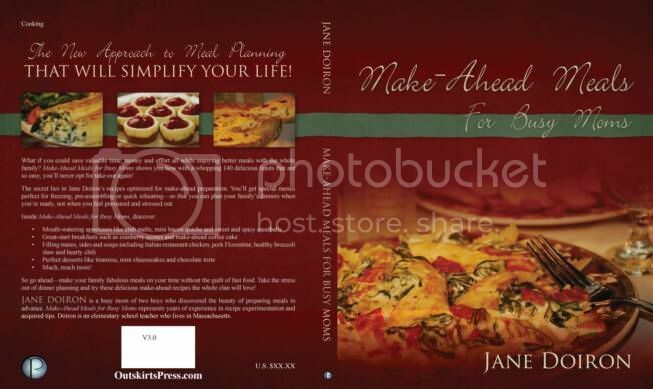 These little tips are the kind that you will find in the Make Ahead Meals for Busy Moms by Jane Doiron. The recipes in the book are simple and easy to prepare. Most of them don’t carry a long list of ingredients, and the ingredients used can be easily found in any grocery store. No need to go hunting stores for ingredients. They are written in simple, easy to understand language so you won’t have to be looking up what certain terms mean when all you want to do is get dinner on the table. This is my kind of book. Simple, easy, practical and no fuss. The only thing I wish it had was more photos. I do love cookbooks with photos! 1. Subscribe to the Make Ahead Meals Newsletter. You’ll be glad you did. You can get more excellent tips and ideas via email. 2. Follow me on Twitter and tweet this giveaway. Leave the link. You can also tweet daily, just leave me a comment each time you do for additional entries. 3. Share this giveaway in other media such as StumbleUpon, Digg, Facebook, Reddit, etc. There is a share button at the end of this post for your convenience. Just make sure to come back and leave a comment for each share you make and you will gain an entry for each one. 5. Follow this blog on Networked Blogs. Widget at the bottom of the page.